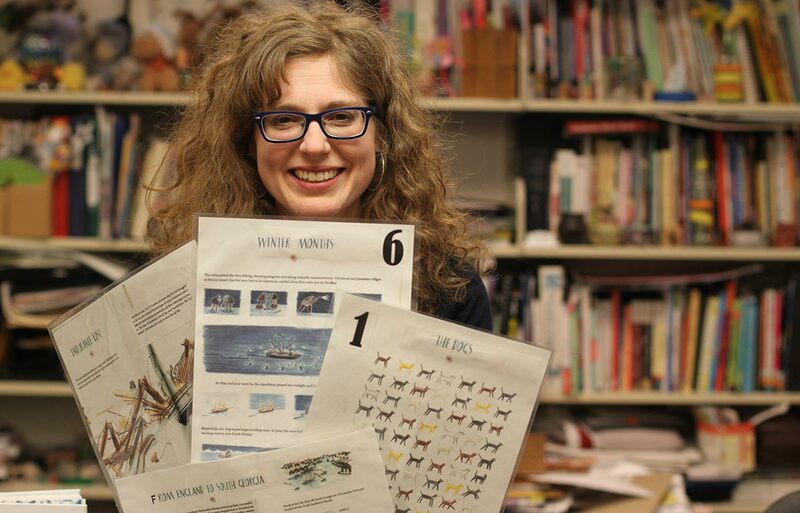 Beth Reynolds has been a bookseller for 20-plus years, 15 of them at the Norwich Bookstore. She spends her weekdays in the children's section of the Norwich Public Library, but on Saturdays you can find her here, helping a child find the perfect birthday present or recommending books to adults looking to get lost in a good read. I loved Rowley's first book, Lily and the Octopus, with an intense passion, so I was skeptical of feeling as connected to his second book. But I opened it and started reading and laughing along with his character. A few chapters in and I was beyond smitten. His take on the publishing industry is full of these little nods to the reader that invite us along for a front row seat to the authorly escapades. James's search for his ending drives us to the inevitable end of Rowley's novel and we are left happier for having the adventure, but still sad that it's over. Maybe you could use a little more Jackie in your life too? This book is the read you didn't know you needed. Centering around a mother/son relationship and perfect for Mother’s Day. Filled with my favorite sort of writing: those pieces that you read over coffee or your morning commute that you dogear so that you can photocopy it later and hang it on the fridge or bulletin board. It yellows with age, but still has the power to remind you of the time you felt a deep connection. The best part, all those great pieces are here in one collection. You can give the book to your friends and save yourself from all that silly photocopying and printing. I bet they’ll hug you and then read aloud the lines that resonated most. I had forgotten how to laugh. Opening this book and starting to read, I couldn’t help myself. It just came bubbling up. What a wonderful thing it is to hold in your hands something that has the power to make one erupt with hoots and howls. Helen Ellis is a treasure and a gift from the gods, she says it like it is in Southern Lady speak and we love her all the more for the joy she has given us. This book is unlike any other I have ever discovered. Take a moment and read the Table of Contents-- pure poetry. Then turn it over and read the back cover. If, like me, you find yourself entranced, falling under the spell of Maria’s words, then you need to read these essays, slowly savoring the experience. For those of us who subscribe to her email newsletter, Brain Pickings, this culmination of her work is a joy to behold. For those of you who are new to her work, this may have you scurrying back to read every last archive. The way these lives she illuminates intersect, the love that people have for each other, this is what is giving me hope and encouragement these days. I feel like this writing has seeped into my DNA and made some everlasting changes in the way I see the world. ‘It was a square meal and a good night’s sleep and a long blood spattered howl at the moon rolled into one.’ This line stayed with me, for the power it has to convey a deep and fully encompassing experience. Such is the mastery of Helen Oyeyemi’s writing. This is my fourth book and each one has blown my mind, but each in a different way. I thought I knew what this latest novel was about and then I got further and further in and discovered that the forest of words I entered was vast and deep, and thrilling in ways I didn’t expect. The path through the layers of story contains twists and turns that deposit you blinking back in the real world at the end. But like a fun house ride that spits you out into the bright sunlight, you want to instantly run back to the entrance just for the sheer thrill of it. Utterly delectable and delicious. Grief hits us all in a variety of ways and dealing with the pain is unique to each individual. It should come as no surprise that my way through the devastation is to read. Smyth’s debut illuminates the parallels between losing her father and reading her beloved Woolf. For her, reading is an act of response, writing as an act of mercy and clarity. There is much to parse through here as she tries to reach back into the past to make sense of her father’s untimely death. In the vein of H is for Hawk, we see how an absence becomes a presence and how our lives can still be guided by it. Reading her words allows us to empathize, sympathize and take notes for the journey ahead. I love books that make you feel deeply, that offer you a chance to empathize and connect with a character. But even more so the books that knock me flat are the ones that throw me a curve ball; I didn’t see coming. Despite it’s trim size, there is so much to admire here. Spare and simple, but overflowing with creativity and deep emotion, it left me with these visuals that will still pop into my head from time to time. By the last scene, I knew that Nunez had left her writerly mark on me again. Apollo joins the ranks of dogs (Old Dan, Little Ann, Beautiful Joe and Winn Dixie) who have taken up permanent residence with me. I was surprised to see that an author I admire (her Still Writing is a permanent bedside fixture) had written a non-fiction book that was straight out of the fiction she had been creating all these years. As I was reading, I kept thinking how lucky she was that she could turn to her words for help. The very act of writing allowed her to make sense of something that could have been devastating. She did what she’s always advised us to do—she wrote her way out. This slim work touches on many universal themes: The meaning of family, both biological and chosen. What we are given by our parents and what we honor enough to pass along to our children. The examination of the loss of identity and the questioning of self. Heartbreaking and utterly hopeful, this book help me revisit all that I hold dear. I must confess, I have fallen a little bit in love with you. Let me count the ways: All those beautiful book covers featured on your pages so lovingly rendered. The portraits of special bookshops, the quizzes, the writing rooms. So much interesting information, each page a joyful, delightful surprise. I promise never to get tired of you or let your pages get dusty. Think of the countless hour we'll spend together, if only you'll be mine. In the tradition of The Iron Giant and The Wild Robot comes Paragon, a robot built by scientists who comes to gain the trust and love of a boy. Auden Dare can't see colors and believing his uncle has found a cure, he sets out to discover the truth. With mysterious clues, secret codes, a lovely friendship with Vivi and a focus on the dire consequences of environmental issues, this is a perfect book. It left me unexpectedly in tears and would be a fabulous read aloud. My favorite trend this year? Heavy topics told in such a way that they become bearable, as opposed to heavy tomes I wouldn't have the physical or emotional strength to pick up. Novey’s second novel joins my favorite slim works such as Exit West, We the Animals, Speak No Evil and Zinzi Clemmon’s book, What We Lose. Interspersed with plays, bookseller reports and told from multiple points of view, the formatting gives an air of playfulness while the narcissism and evil runs like a river underneath it all. Reading this enforced for me the call to action and the reasons to not stay silent. Chung’s incredibly honest and eloquent search for identity captivated me. As an Asian girl in a white family, her need to belong was a powerful desire. Her parents, wanting her to be happy, shut the door to any inquiry. As she got older she sought clues of her past, ferreted out from boxes hidden away in closets and yellowed envelopes tucked in drawers. Still, the black hole her of not-knowing threatened to swallow her up. Chung’s journey to find her heritage brings to light our misguided tendencies to sweep everything under the rug. This is the book we need to start more conversations about race, family, adoptions and the way to move incrementally forward. This is your next book club pick. I love projects that strip us down to our very essence: one word, one image, and in this case, one thing we cherish above all others. Each pairing here is inspiring, each essay simple and thought-provoking, bringing to light our shared humanity. For the most part these are everyday items that might be tossed aside or skipped over, but because of their history they have become imbued with a patina of meaning. It takes courage to pick just one thing to represent your life, what do you think you might choose? Put this beauty in a place where you can reach for it often, it deserves to be savored and reread many times. The book just feels nice in your hand and when I picked it up I was reminded of how much I like to sit with a story. Initially I was intrigued because some authors were familiar and others were new to me. Alexander Chee, Jason Reynolds, Brandon Taylor, Yiyun Li, all writers I greatly admire, and here they all are in one fabulous collection. My best advice: once you are done allow the characters to linger in your life for a bit. Too often we overlook the possibility of a short story; the breadth and depth that is covered, underestimating the far-reaching abilities of a complete world created in the span of a few pages. The best ones have the power to change us, even imperceptibly, but forever. In the tradition of The Mothers, Exit West, Speak No Evil and What We Lose, Kwon’s novel packs dazzling prose and centers around a heavy topic, yet all marvelously contained in a small amount of pages. The Incendiaries asks essential life questions: What happens if you put all your faith into something and then discover that the bottom falls out from under you leaving you no solid base? What do you replace it with, do you rebuild or start over? In her debut, Kwon gives us three different points of view, twentysomethings who hold onto each other so they don’t hit rock bottom. In an interview I read, one of several insightful pieces, she talked about writing on the syllable level. This granular, elemental level speaks to me, the atoms from which all creations come. I would read anything that flows from her pen. 1. Pick up High Season and turn to page 76. 2. Start reading at the bottom, "Summer is my favorite season..."
3 Imagine yourself continuing in the sunshine, with a cool drink close at hand. 4 Buy book and read it while you ignore the rest of the world. 5 Finish by having your breath taken away by the last line. 6 Come in and tell us some of your favorite lines. We love talking books with you, and *bonus* we can recommend another so you can start the whole process all over again. Summer should be about losing yourself in a book. This is a great place to start. I've paged through dozens of books on handlettering (You may have noticed that they are in abundance, lettering is having a moment.) What sets this one apart is Nicole. She has you start out simply by making patterns and then guides you along to writing on different materials. She encourages you to keep that first sheet so you can eventually see how far you've come. I love the projects and found the photos to be clear and helpful. Most of all, Nicole's enthusiasm is infectious. Bring in your projects and we can compare notes. Don't forget to grab some pens while you're here, that's part of the fun! In 1985 Chicago Yale Tishman is struggling in his life, personally and professionally. In 2015 Fiona, sister to his friend Nico, has made her way to Paris to find her estranged daughter. The connections between these two span the decades, their hopes and desires form a lens through which we see their lives in the past and present. Reading the last few chapters became a singular moment. I fell into a puddle on the floor as the wave of everything that has been lost washed over me. Makkai has done it again, giving us a glimpse into the world she has masterfully created in order to make some sense of our own. Nat is searching for something.To know more about her mom, to have a friend, to find a place where she belongs instead of always moving around with her father the celebrity. The title seduced me , but it was the friendship that kept me reading. Nat is doing her best to try and figure out how to navigate in a world that’s constantly changing. Her relationship with Harry, and her phone calls to a woman she’s never met become her touchstone. There were some sweet surprises and of course, the possibility of whales. That alone is reason enough to pick up this book. Wolitzer’s latest novel explores the lives of women in different generations. The way we forge ahead and the way certain interactions or trauma can put us on another path. The way we break apart and come back together. The way our lives weave in and out of each other’s. What we as women take from the previous generation and what we teach the next. Greer and Zee and Cory and Faith. You see their genesis, which is not something we are always aware of in our own lives, but to examine it in a story is a beautiful thing. We see the effects of ambition, desire or how a tragedy can shape the person you become. The Female Persuasion is multi-layered, rich and complex, yet as simple as hearing your friend tell you the story of her life over coffee. Reading these email exchanges between a brother and a sister is addictive. You think you can stop, but then you decide to read just one more. So much of what I’ve been reading lately has been about race and resistance. And while I’ve learned so much from these incredible authors, sometimes a funny book can provide a much-needed break from reality. I thoroughly enjoyed spending time with this writer and his sister, the photographer. Their distinctive voices are witty and sharp; stumbling onto this book was a delightful surprise. Honest and enlightening, Jerkin’s debut essay collection is just what I wanted it to be-- short bits that allow me to sit with a topic for awhile before plunging straight back in for more. There are surprising points of connection, but more importantly I’ve learned about black culture and her experience with men, hair products, and the Black Lives Matter movement. It takes courage to write about one’s life at such a young age. The shortest passages “How to Be Docile” and “How to Survive” pack a gut punch. They may be small, but they are fierce. That last line is everything. It gives me the inspiration to keep writing, keep pushing, keep reaching. The best essays teach and inspire in equal measure, Jerkins is one to watch. There is something so freeing about opening up a book and realizing that you could start anywhere, no need to be limited by the typically demanding page one; instead each category offers a new place to begin. Zadie’s astounding talent is apparent in ways big and small, the breath and depth of her topics is far reaching. I was delighted to find that two of my favorite essays “Joy” and “Find your Beach” have been included here. I’ve just recently discovered her commentary on the movie “Get Out” and her piece on Key and Peele, both tilted the axis of my world a little. I will always, always love Zadie’s introduction to "Through the Looking Glass" (illustrated by Mervyn Peake), but now I have several more essays to return too when I am overtaken by the need to reread something that speaks to me. Gordon’s books are delightful, his characters seem so charming and sincere. They have flaws and imperfections, but the friendship between the characters is always the stronger force. In this story, George is always turning down invitations to travel in favor of staying home to bake. It isn’t until he meets Pascal that he discovers the real reason for sticking close to home. Here’s to the power of creativity, persistence and the possibility of a freshly baked pie. I love the bits of newspaper, photographs and other ephemera sprinkled throughout. I haven’t had a book crush this hard since his first -- Herman and Rosie. Machado’s collection is explosive, jagged, and delightfully unexpected. She makes me want to be a better writer, maybe toss up all the words and see how they land. The ideas presented here are reconstructed in surprising combinations that shift the paradigm of writer and then of reader. I was thoroughly engaged and quietly astonished at her mastery, wit and love of folklore and fairytales. This National Book Award finalist is familiar and revelatory all at the same time--it deserves a spot on your bedside reading table. To briefly describe this novel, one could say it is a portrait of a writer as a mother. The story begins before she is married, insisting she doesn't want children. We trace her trajectory from wife to mother back to writer. Wolas sprinkles snippets of Joan's stories throughout. I would get lost in one, and when I came back up for air, it was only then that I would grasp the true level of the author's mastery. This is clearly my hands down favorite novel of the year, which takes on art, betrayal, self discovery, travel and the sacred art of writing. For anyone who believes in the power of words and the lure of a story well told.